Yesterday was my first time at Lush & I went crazy! For a long time, I had been reading about Lush products and looking at reviews online, but I never ordered or went to the store. There are several locations in NYC and when I happened to be in the area of one I decided to go for it! This has been a super stressful month & there is more to come so the idea of having a nice relaxing bath was too good to pass up. I came in with the intention of picking up a couple of bath bombs but ended up being sucked in to a lot more (courtesy of the incredibly nice staff and the amazing smells.) Below are some pictures of what I purchased, along with a few keyword descriptions. I literally keep going to the bag & smelling in it. Amazing! Last night, I used Dragon's Egg and Yuzu & Cocoa together (recommended by the staff at Lush.) I broke them apart and used probably about a quarter of each. I have a tiny NYC bathtub & bathroom so using a whole bomb would probably be overwhelming. Plus it's going to let me have a lot more baths! With Dragon's Egg breaking it did make it less of a "show." The orange and gold colours went around simultaneously but knowing I can have about four baths with it makes up for it. The water was so soft and smelled citrus-y & sweet. I can't wait to use more of my new Lush products! As well as try some more! I'm thinking about next checking out the skincare like masks & toners. Have you ever tried Lush products? What are some of your favourites? 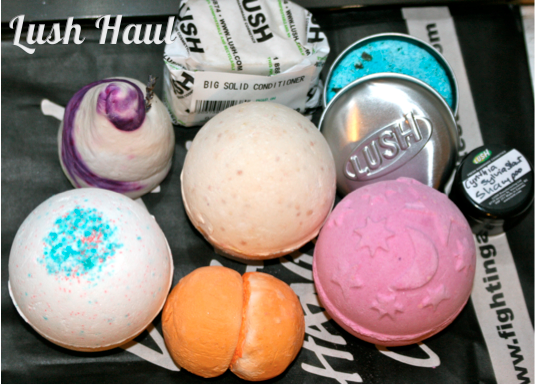 Omg I've seroously been wanting to try Lush products for the longest! I really need to break down and just buy some online haha, thanks for the review! Just go for it! lol. I have been loving everything so far!